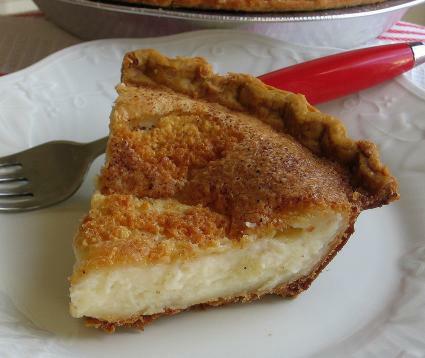 Sugar cream pie is a simple recipe that starts with a flaky, unbaked crust and a filling with just five ingredients and an optional sprinkle of nutmeg. What sets this apart from a custard pie is the absence of eggs and a lighter filling color than the golden-yellow of an egg-custard pie. Sugar cream pie comes together in a snap. The longest time investment in this recipe is the bake which takes one hour. Traditional recipes call for white sugar but some variations call for equal parts of white and packed brown sugar. Another variation is the use of all heavy whipping cream rather than a combination of cream and half-and-half. Vanilla and nutmeg also are optional. Heat the oven to 425 degrees F. Place the unbaked pie shell on a rimmed sheet pan to catch any drips. Loosely wrap the exposed edges of the pie shell with foil or use a pie crust shield to prevent over-browning. Set aside. In a medium bowl, whisk together heavy cream, half-and-half, sugar, flour, and optional vanilla. Pour into the prepared pie shell. Scatter optional pieces of butter evenly across the filling. Sprinkle with nutmeg. Bake for 15 minutes. Reduce heat to 350 degrees F. Bake 45 more minutes. Check for doneness by inserting a thin knife into the center of the pie. If it comes out relatively clean (a little moisture may remain), the pie is done. Remove from oven and transfer to a wire rack to cool completely. Refrigerate the pie for at least two hours before slicing. The pie is very sweet and requires no additional embellishment. Old-fashioned sugar cream pie also is known as Hoosier sugar cream pie, Indiana sugar cream pie and finger pie. The latter -- finger pie -- comes from practical cooks who, instead of dirtying a bowl, mixed the ingredients together with a finger directly in the crust. The "Hoosier" and "Indiana" in the pie name comes from the Amish and Shaker families who made this dessert in early Indiana farming communities, having brought the recipe with them, many believe, from Western Europe. The dessert remains popular and was named the state pie in 2009. The flavor is remarkable for an open-face pie (bottom crust only) known as a "desperation pie" because it was made from whatever was on hand, including an abundance of milk and cream in farm households. It can be eaten warm, but it sets up better after a chill in the refrigerator for a few hours. The pie is very sweet so a simple garnish of unsweetened whipped cream and, perhaps, sliced berries is all it takes to turn this into a company-worthy dessert.